When: December 22, 1 p.m.
Background/Thoughts: The former Humanitarian Bowl was renamed in 2011 to better reflect society’s general apathy toward humanitarian efforts and love of tubers. San Diego State won its only appearance in this game in 2013, a 49-24 win over Buffalo. When: December 29, 2:30 p.m.
Background/Thoughts: The Arizona Bowl is entering its third season and is a bowl game. The U-T’s Kirk D. Kenney threw out the possibility of the Arizona Bowl pulling a Pac-12 team into the game, so let’s run with it. Why not? When: December 24, 5:30 p.m.
Background/Thoughts: Hawai’i Bowl has existed since 2002, and the Aztecs were 42-7 victors over Cincinnati in their lone appearance in 2015. UCF is almost certainly not playing in this game, and South Florida seems destined to stay in Tampa for their game. Memphis would be fantastic if SDSU ends up here. When: December 16, 1:30 p.m.
Background/Thoughts: Since 2006, the New Mexico Bowl has existed in the world of bowl games in which bowl eligible teams participate. San Diego State has never played in this game, a streak we’re desperately hoping will continue this year (Editor’s note: uh oh). Rocky Long won the game as New Mexico’s head coach in 2007. When: December 26, 6 p.m.
Background/Thoughts: This bowl affiliation is provisional, and is based on whether a “more desirable”, bowl-eligible option out of the aforementioned Power 5 conferences can fill the spot. It seems likely both will able to, so we’re probably wasting our time here. However, if so … this game would have SDSU vs. a Power 5 school in a destination San Diegans would be more likely to travel to with the relatively short notice provided by bowl season. When: December 20, 5 p.m.
Background/Thoughts: This is the inaugural Frisco Bowl, so the only history there … is the history to be made. *punches self* Originally dreamed up as a bowl game pitting the AAC vs. Sun Belt, MAC and Sun Belt opponents over the next three seasons, it’s currently an AAC vs. At-Large game. With UCF likely going to the New Year’s Six and South Florida staying in Tampa to play in the Bad Boy Mowers Gasparilla Bowl (this is a real bowl game), Memphis is (again) the most desirable opponent for San Diego State out of the AAC. This game would continue the tradition of taking a San Diego football team and having them play in an MLS stadium. Where: Levi’s Stadium – Santa Clara, Calif. 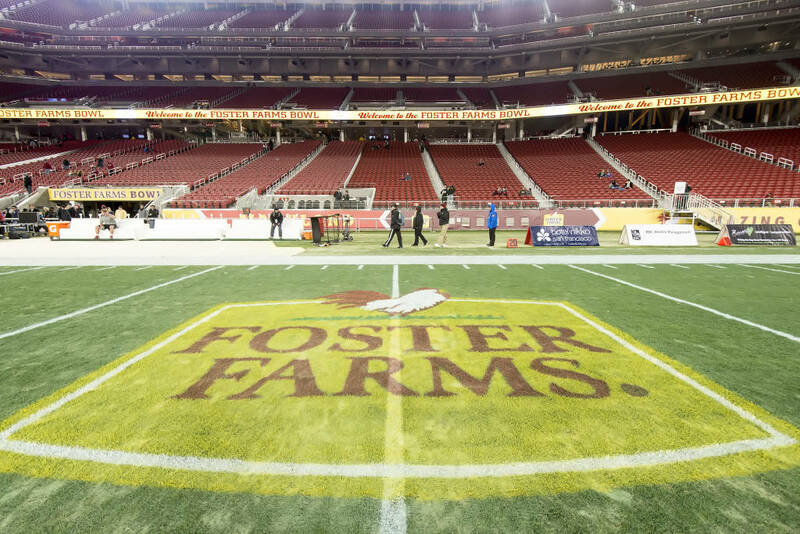 When: December 27, 5:30 p.m.
Background/Thoughts: The Foster Farms Bowl used to be known as the Diamond Walnut San Francisco Bowl, Emerald Bowl and Kraft Fight Hunger Bowl when it took place at Pac Bell Park/SBC Park/AT&T Park. Now, it’s sponsored by a chicken company and takes place at Levi’s Stadium – inexplicable home to way too many large events for the billion-dollar shithole that it is. Anyway, like the Cactus Bowl, this is a provisional game. That said, the Big Ten isn’t going to have enough bowl-eligible teams to cover their tie-in games, allowing a team like San Diego State to jump in the mix. Washington State seems to be the consensus pick from the Pac-12, and their opponent is a projected grab bag. NBC has San Diego State going here, and that would be tremendous. Pac-12 opponent, easy travel and a prime time game on a major network? This is the game we want. Give us this game. They’re not going to give us this game, are they?